How do you see the SPX closing on Monday (2/25)? Poll closed Feb 25, 2019. Congrats to @stock1234 the Stockaholics Daily Stock Pick Winner for (2/22)! On to the next! 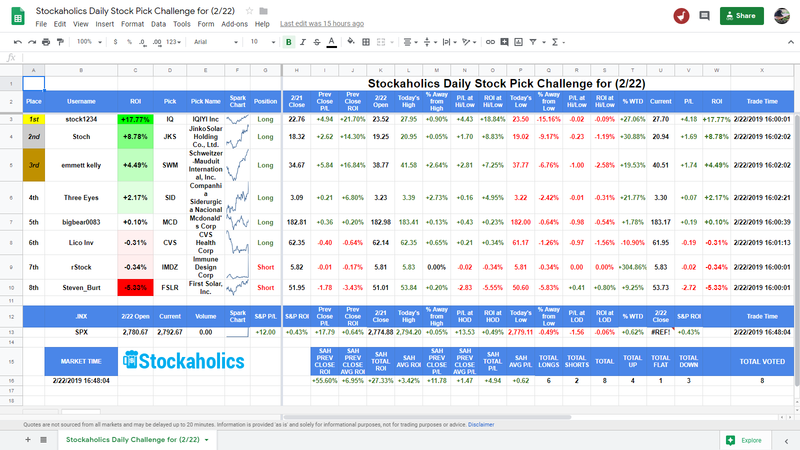 The Stockaholics Daily Stock Picking Challenge for (2/25) starts at the opening bell on Monday, February 25th, 2019. 3.) Your pick MUST be at least $2 at the previous day's closing price at the bare minimum! If you pick something that is under $2 then your pick will not count, and you will not be entered into the daily stock picking challenge! 3.) If you don't post both the ticker AND the direction (LONG/SHORT) you won't be added to the list of contestants for the daily stock picking challenge! 4.) You cannot duplicate someone's exact pick! 5.) Picks absolutely MUST be posted in here before 4AM eastern time the day of the contest! 7.) RATIONALE - You may post up a rationale (either technical or fundamental) for your pick but it is not required. This is optional for everyone. Members who do post up a rationale for their pick will receive an additional 2 points in the members leaderboard. 8.) Please DO NOT EDIT your original post with your pick! If you absolutely must choose another pick, please use a separate post and state that you are changing your original pick to something else! 9.) You may choose to close out your pick at any time during the trading day. PLEASE POST YOUR OWN CLOSING PRICE! We will be using the intraday 1 minute closing price using the time stamp of your post on Stockaholics for when you closed out your pick. You will need to state the price & the time of when you closed out. I will be confirming that your closing price is correct by looking at the 1 min. intraday chart. 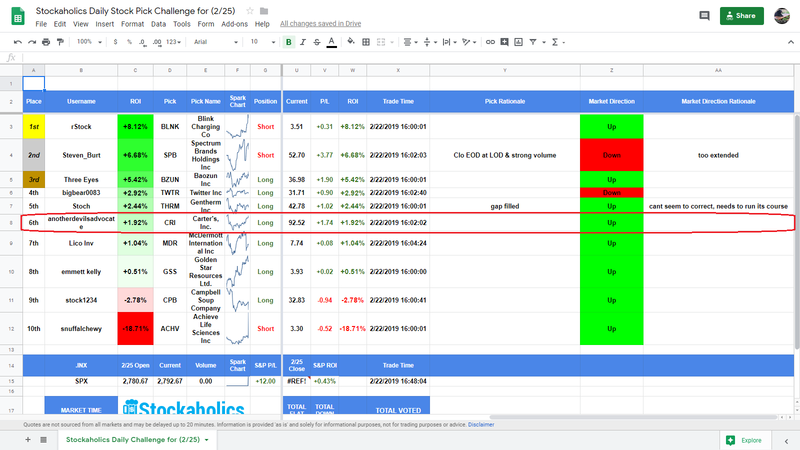 If it is not correct, I will then post up your correct price and input that into the live spreadsheet. Remember...the challenge starts at the opening bell on Monday, February 25th! How does Stockaholics think the S&P500 will close 2/25? Stockaholics wins the daily poll tally on Friday! Credit goes to the UP votes! 1) For purpose of the spreadsheet record flat is currently based on +/-0.15% or less. Of course, everyone can define flat any way they choose. 3) It's OK to post your vote if you missed the deadline after the poll has expired and if the market has not really moved that much or especially if your late vote is opposite or flat of the S&P futures ATM. It will be up to my discretion and obviously, the more active voters will be given more leeway. 4) Starting and ending points based on official daily ending close of the market. 5) The primary goal of this game is to track our performance. You can consider it a contest or as a personal critiquing tool to better ones performance. 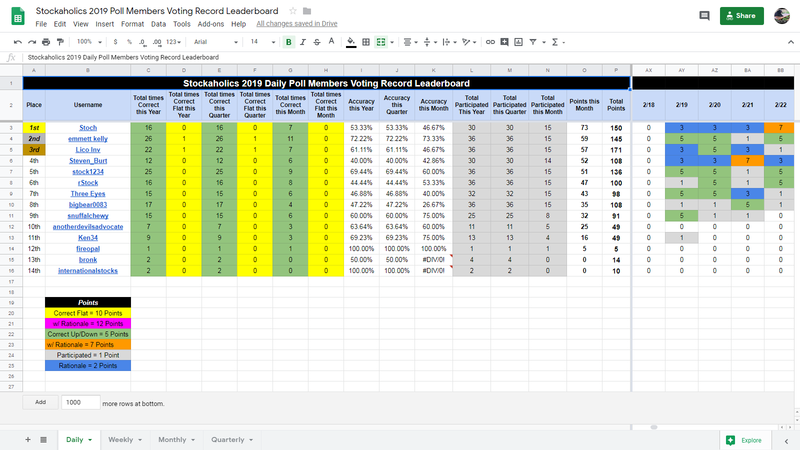 Congratulations to today's daily stock pick winner and 3rd time winner of the daily stock pick challenge in 2019 (1st time winner in February!) -- @stock1234! Some worthy mentions also go out to our 2nd place winner -- @Stoch and 3rd place winner -- @emmett kelly! @rStock is still our current leader this month with 104 points! 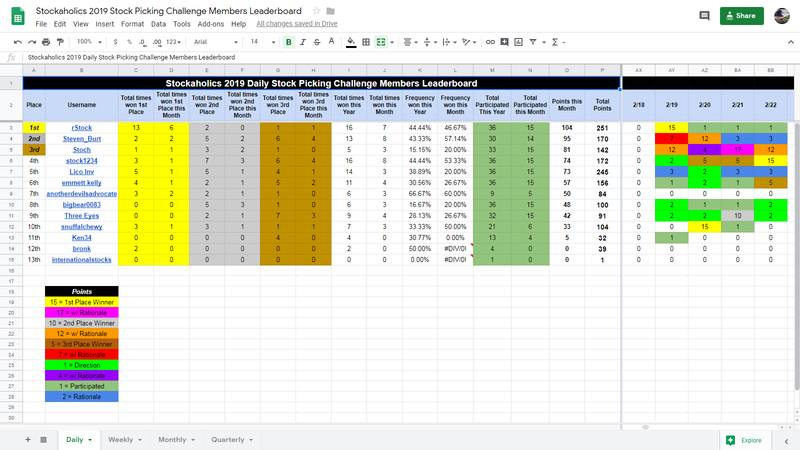 And lastly, we have the complete daily stock picking challenge members history which includes every pick posted from our active participants this year! Longest active daily poll winning streak belongs to NONE with 0 straight correct daily market calls. 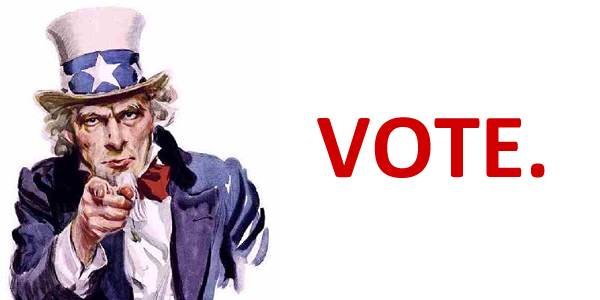 Best overall daily poll percentage leader in 2019 belongs to @emmett kelly at 72.22% daily poll voting accuracy this year. Best overall daily poll percentage leader this month belongs to @emmett kelly at 73.33% daily poll voting accuracy this month. 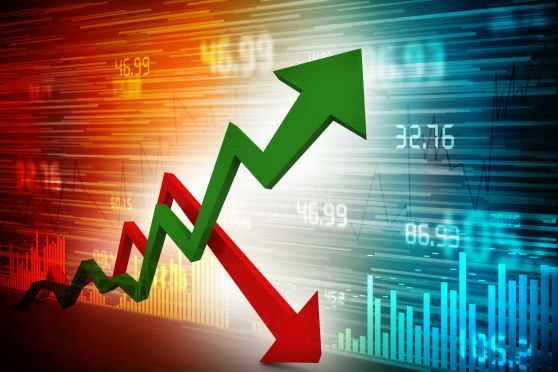 Most consecutive correct daily market calls in 2019 belongs to @bigbear0083 9 correct calls. Most consecutive correct daily market calls ever belongs to @stock1234 with 16 correct calls in 2017. @Stoch is still our current leader this month with 73 points! Please Post your Vote on this thread and make sure to also click in your Vote on the poll at the top by 4AM eastern time on Monday! just posting this here so i don't forget to add your daily market direction vote for today in my spreadsheet marcy. I voted late last night so wasn't sure it was fair to get credit for the market direction. I put it in the Google sheet because it's required. Please close CRI at 101.75, 9:48am. LOL I mis-interpreted the size of the candle in CRI, guess it is too low volatility. Maybe I can get 4th place hehe.